Rare diseases are life-threatening or chronically debilitating conditions which are of such low prevalence (fewer than 1 in 2000 people) that special combined efforts are needed to address them . Launched in 2008 by Rare Diseases Europe (EURORDIS), a non-governmental patient-driven alliance representing 733 rare disease patient organisations in 64 countries, Rare Disease Day (figure 1) takes place on the last day of February each year. The main objective of Rare Disease Day is to raise awareness amongst the general public and decision-makers about rare diseases and their impact on patients' lives . In 2017, Rare Disease Day will emphasise that research brings hope to people living with a rare disease . Indeed, due to the rarity and diversity of rare diseases, research needs to be international to ensure that experts, researchers and clinicians are connected, that clinical trials are multinational, and that patients can benefit from the pooling of resources across borders . The logo of Rare Disease Day (www.rarediseaseday.org). Supporting education, research and care related to rare diseases is very timely in Europe, with the announcement on December 15 2016 that the European Commission's Board of Member States had approved 23 European Reference Networks (ERNs), including one for rare respiratory diseases (ERN-LUNG; table 1) . Furthermore, in order to share knowledge and expertise more efficiently, the European Union Committee of Experts on Rare Diseases (EUCERD) has adopted recommendations on quality criteria for centres of expertise in rare diseases in member states . Centres of expertise should allow the concentration of both expertise and patient numbers in one place to tackle rare or complex diseases and conditions more effectively [3, 4]. Developing centres of expertise and ERNs in the field of rare diseases was proposed in the European Council recommendation for action in the field of rare diseases and more recently in the cross-border healthcare directive as a means of organising care for the thousands of heterogeneous rare conditions affecting scattered patient populations across Europe . The ERN-LUNG is a network of European healthcare providers dedicated to ensuring and promoting excellence in care and research for the benefit of patients affected by rare respiratory diseases. ERN-LUNG's vision is to be a European knowledge hub for such diseases and to decrease morbidity and mortality from them in people of all ages. It is a non-profit, international, professional, patient-centric and scientific network and it is committed Europe-wide and globally to the prevention, diagnosis and treatment of rare respiratory diseases through patient care and advocacy, education and research. In keeping with these goals, ERN-LUNG will interact with both national and international organisations which have similar goals. ERN-LUNG is currently made up of 60 centres in 12 countries and is organised into nine core networks representing the diversity of diseases and conditions affecting the respiratory system (figure 2, table 2). The current core networks are interstitial lung diseases [5–21], cystic fibrosis [22–25], pulmonary hypertension [26–31], primary ciliary dyskinesia [32–37], non-cystic fibrosis bronchiectasis [38–40], α1-antitrypsin deficiency , mesothelioma , chronic lung allograft dysfunction [43–45] and “other rare lung diseases” (e.g. pulmonary malformations, congenital central hypoventilation syndrome etc) [46–49]. 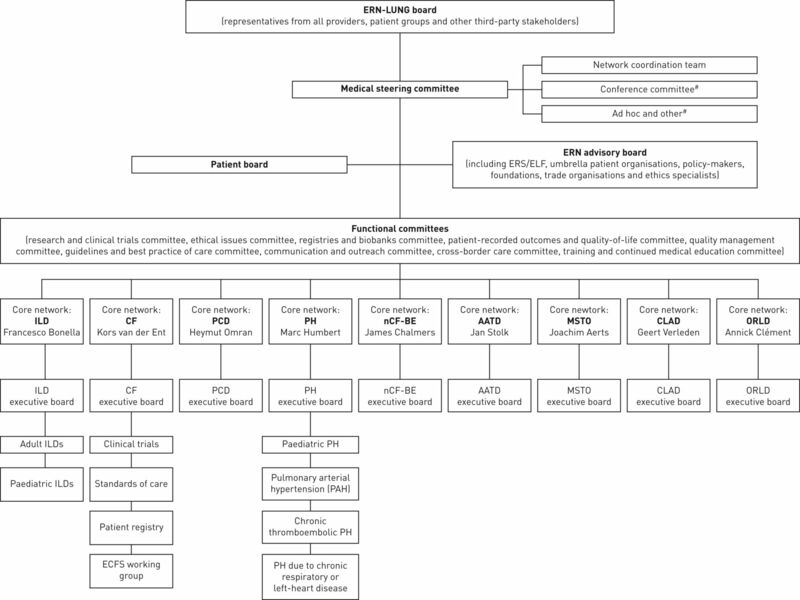 In addition to these thematic subgroups, ERN-LUNG is also organised into functional committees whose aims are to tackle overarching topics affecting all of the current and future core networks, including research and clinical trials, ethical issues, registries and biobanks, patient-reported outcomes and quality-of-life, quality management, guidelines and best practice of care, communication and outreach, cross-border care, and training and continued medical education. The ERN-LUNG's current set-up will evolve with the inclusion of more members and partners after it is formally established. The creation of a ninth core network on “other rare lung diseases” is intended to serve as an intermediate solution to the question of the formal creation of additional core networks over the next 5 years, covering groups that could not formally become core networks in the initial application stage. The strategic plan for ERN-LUNG is set out in a multi-annual work plan submitted in response to the call for Framework Partnership Agreements for the period 2017–2021 (Chafea: HP-ERN-2016). The plan sets out an evaluation strategy that will be followed to review the ERN-LUNG's achievements within the first 5 years of its establishment. The ERN awarding ceremony will take place on March 9–10, in Vilnius, Lithuania, in the presence of ERN coordinators and patients' representatives. A few weeks later, the ERN-LUNG kick-off meeting will take place on April 4–5 in Frankfurt with all the healthcare providers and patients' representatives attending. The European Respiratory Society has always been very supportive of rare pulmonary disease research, education and care, and the society's publications regularly disseminate novel data and guidelines in these fields [50, 51]. Of note, the society will endorse the 7th International Meeting on Pulmonary Rare Diseases and Orphan Drugs, which will take place in Milan, Italy on February 24–25. This conference, chaired by Dr Sergio Harari, Chief Editor of the European Respiratory Review, is dedicated entirely to rare pulmonary diseases and rare variants of more common pulmonary conditions. The proceedings from this conference will be published in the European Respiratory Review and updates from the ERN-LUNG will feature regularly in the European Respiratory Journal. Rare respiratory diseases are indeed ready for primetime! Rare (Pulmonary) Disease Day: “Feeding the breath, Energy for life!” Eur Respir J 2015; 45: 297–300. Rare Diseases Europe (EURORDIS). What is rare disease day? 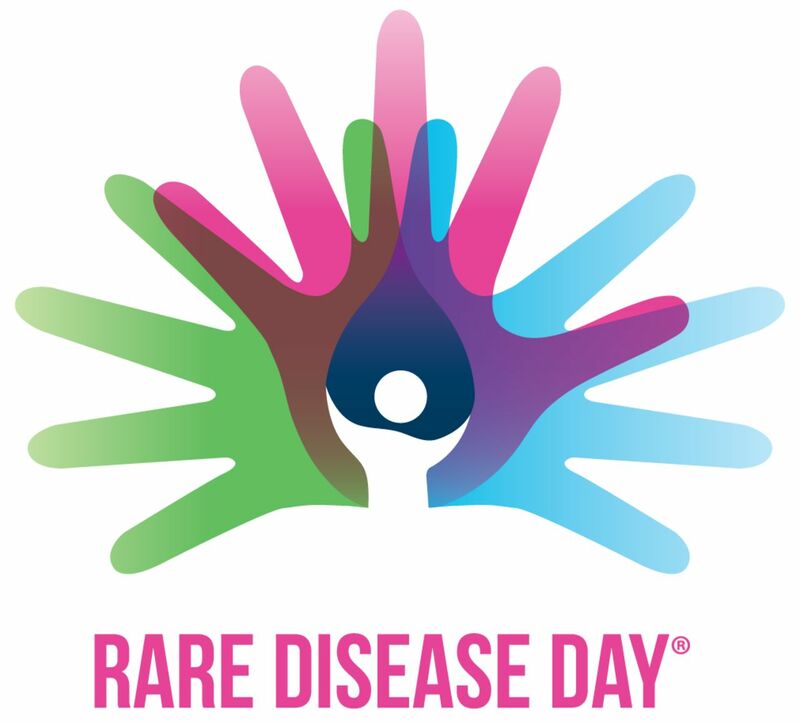 www.rarediseaseday.org/article/what-is-rare-disease-day Date last accessed: December 26 2016. The European Commission Directorate of Health and Food Safety. European reference networks: call for applications 2016. http://ec.europa.eu/health/ern/implementation/call_en Date last accessed: December 26 2016.
. European reference networks: moving towards a tangible outcome of the European Union's cross-border healthcare directive. Eur Respir J 2016; 48: 1564–1568. Acute exacerbation of idiopathic pulmonary fibrosis: shifting the paradigm. Eur Respir J 2015; 46: 512–520.
. The changing face of a rare disease: lymphangioleiomyomatosis. Eur Respir J 2015; 46: 1471–1485. Severity and outcome of cystic lung disease in women with tuberous sclerosis complex. Eur Respir J 2015; 45: 171–180. Recurrent NRAS mutations in pulmonary Langerhans cell histiocytosis. Eur Respir J 2016; 47: 1785–1796. Prevalence and characteristics of TERT and TERC mutations in suspected genetic pulmonary fibrosis. Eur Respir J 2016; 48: 1721–1731. Telomere-related lung fibrosis is diagnostically heterogeneous but uniformly progressive. Eur Respir J 2016; 48: 1710–1720. Management of children with interstitial lung diseases: the difficult issue of acute exacerbations. Eur Respir J 2016; 48: 1559–1563. Risk of hypersensitivity pneumonitis and interstitial lung diseases among pigeon breeders. Eur Respir J 2016; 48: 818–825. Nonspecific interstitial pneumonia: survival is influenced by the underlying cause. Eur Respir J 2015; 45: 746–755.
. Assessing the worldwide epidemiology of sarcoidosis: challenges and future directions. Eur Respir J 2016; 48: 1545–1548. Sarcoidosis-related mortality in France: a multiple-cause-of-death analysis. Eur Respir J 2016; 48: 1700–1709. Beryllium-induced lung disease exhibits expression profiles similar to sarcoidosis. Eur Respir J 2016; 47: 1797–1808. Public awareness on cystic fibrosis: results from a national pragmatic survey. Eur Respir J 2015; 46: 264–267. Pulmonary veno-occlusive disease. Eur Respir J 2016; 47: 1518–1534. Genetic counselling in a national referral centre for pulmonary hypertension. Eur Respir J 2016; 47: 541–552. Pulmonary arterial hypertension in patients treated with interferon. Eur Respir J 2015; 46: 1851–1853. Genetic analyses in a cohort of children with pulmonary hypertension. Eur Respir J 2016; 48: 1118–1126. BMPR2 mutation status influences bronchial vascular changes in pulmonary arterial hypertension. Eur Respir J 2016; 48: 1668–1681. Diagnosing primary ciliary dyskinesia: an international patient perspective. Eur Respir J 2016; 48: 1096–1107. Clinical manifestations in primary ciliary dyskinesia: systematic review and meta-analysis. Eur Respir J 2016; 48: 1081–1095. An international registry for primary ciliary dyskinesia. Eur Respir J 2016; 47: 849–859. Accuracy of diagnostic testing in primary ciliary dyskinesia. Eur Respir J 2016; 47: 837–848.
. Incidence and familial risk of pleural mesothelioma in Sweden: a national cohort study. Eur Respir J 2016; 48: 873–879. An international ISHLT/ATS/ERS clinical practice guideline: diagnosis and management of bronchiolitis obliterans syndrome. Eur Respir J 2014; 44: 1479–1503. An association of particulate air pollution and traffic exposure with mortality after lung transplantation in Europe. Eur Respir J 2017; 49: 1600484. Chronic effects of air pollution on lung function after lung transplantation in the Systems prediction of Chronic Lung Allograft Dysfunction (SysCLAD) study. Eur Respir J 2017; 49: 1600206. Definition, discrimination, diagnosis and treatment of central breathing disturbances during sleep. Eur Respir J 2017; 49: 1600959. Respiratory manifestations of eosinophilic granulomatosis with polyangiitis (Churg-Strauss). Eur Respir J 2016; 48: 1429–1441. Follow-up of pulmonary right-to-left shunt in hereditary haemorrhagic telangiectasia. Eur Respir J 2016; 47: 1750–1757. Rare pulmonary diseases and orphan drugs: where do we stand and where are we going to? Eur Respir Rev 2015; 24: 375–377.
. Toward better management of rare and orphan pulmonary diseases. Eur Respir J 2016; 47: 1334–1335.